We know that only seas are there on the Earth. But it is discovered recently that there is a sea on the Pluto planet. Pluto is the farthest and last planet in the solar family. But it is not possible for human beings to go there and enjoy on the beach with the tides. Why because the sea is not on the surface of the Pluto. It lies at a depth of 200 kilometers from the surface of the planet. There water is freezed to thick ice. Why because, temperature of the Pluto planet is minus 230 degrees Celsius. Scientists estimate that water exists under the thick layers of ice. They estimate that water exists at a depth of 170 kilometers on the Pluto planet. This was the first discovery about the existence of water in liquid form on the planet other than Earth. As there is maximum possibility of existence of life in the presence of water, this discovery had attracted the attention of entire world. The name Pluto for this planet is derived from the name of Roman Hell King, Pluto. It was named so because of the existence of conditions on this planet are similar to that of hell. Pluto is the farthest planet from the Sun in the solar family. It lies at a distance of 600 crore kilometers from the Sun. Pluto has size of the moon. For one complete revolution around the Sun, Pluto takes 248 years which meant the period of a year on Pluto is equivalent to the period of 248 years on the Earth. Initially everyone got doubt that how could water exist in liquid form at such cold temperature of -230 degrees Celsius on Pluto. But due to the presence of thermo nuclear substances inside the Pluto, heat is produced. Due to this reason, it is believed that ice transforms to water. Complete information on this issue could not be known till 2015. Why because research is still under progress. An astronomical space ship called New Horizons was sent to Pluto from Earth, four years back. It is still in the journey only. It has not yet reached Pluto. It takes another five years for reaching the Pluto planet. After reaching there, it could send accurate photos and information about conditions of the Pluto. 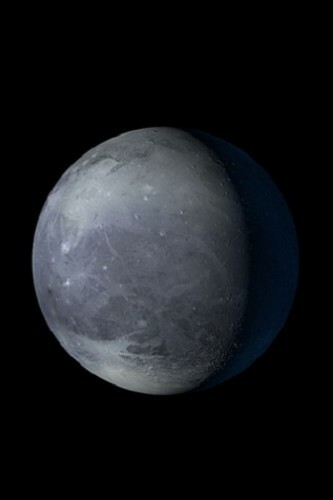 From those photos and information obtained, scientists could get clear idea about the conditions of Pluto planet. New Horizons is traveling with a velocity of 58 thousand kilometers per an hour. Pluto is at a distance of 4.8 crore kilometers from the Earth. So till the Space ship reaches there, we could not get clear information about the conditions of Pluto.